The 31 metre motor yacht Suncoco, jointly listed for sale by Van der Vliet Quality Yachts and Atalanta Marine, has been sold with Van der Vliet introducing the buyer. Built in steel and aluminium to Bureau Veritas class by Dutch yard Lowland Yachts, Suncoco was delivered in 1992 and has been refitted several times, most recently in 2014. Designed by W de Vries Lentsch, she has a luscious interior finished in satin varnished teak throughout. Accommodation is for up to eight guests in four well appointed staterooms consisting of a master suite with a king sized bed, port and starboard VIP staterooms and a twin cabin, all with televisions, DVD systems and full en-suite facilities. Her covered large aft deck has all the amenities for formal al fresco dining including a full wet bar, a barbecue grill and an ice maker plus ample seating. More relaxation areas for avid sunbathers are available on the upper deck and include a Jacuzzi. 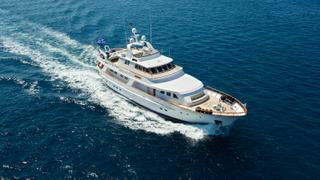 Twin 503hp Caterpillar engines give her a cruising range of 3,000 nautical miles at nine knots.